Walt returned home from France in the fall of 1919, determined to become an artist. He moved into the old Disney house in Kansas City with his brothers, Roy and Herbert (and Herbert’s family), and tried unsuccessfully to get a job as an artist at the Kansas City “Star.” Roy helped him get a position as an apprentice at the Pesmen-Rubin Commercial Art Studio, where he drew horses, cows, and bags of feed for farm-equipment catalogues. Of course, he didn’t ask what he’d be paid: the princely sum of $50 a month. Unfortunately, just before Christmas, there wasn’t enough business to keep him on the payroll, and Walt was laid off. So Walt and Ub Iwerks, another laid-off artist, decided to start a commercial-art business together, called Iwerks-Disney (because the other way around it sounded like an eyeglass company!). 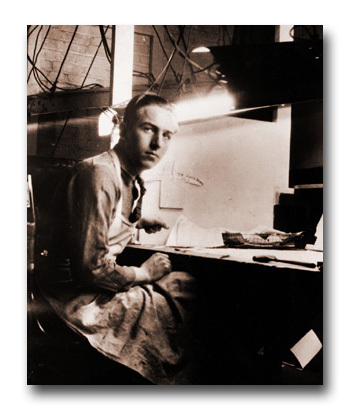 Iwerks-Disney had one big client off the bat; the father of Walt’s old friend Walt Pfeiffer hired them to work on the United Leatherworkers Journal. But business wasn’t booming. Walt was offered a $40-a-week job at the Kansas City Slide Company (later renamed the Kansas City Film Ad Company), making animated commercials. He took the job, and a few months later Ub joined him. Cartoon-making was in its infancy. Even the best — like Krazy Kat and the Katzenjammer Kids — were jerky, repetitive black-and-white efforts based on popular newspaper comic strips. But the public was still intrigued and amazed by the new form of entertainment. As was Walt. He wanted to improve upon the clumsy means of animation used at Kansas City Film Ad. He read books about animation and discovered how the leading New York animators worked. And he started making his own cartoons. Walt agreed to pay his father $5 a month to rent the family’s garage as a studio (though Roy never recalled ever seeing any money actually change hands). After work, Walt stayed up late into the night working on animation. At the time, Kansas City theaters rented cartoons from East Coast animators. Walt decided he could compete with them by creating his own with a local twist. He successfully sold the idea to the Newman Theater and began making his own Newman Laugh-O-grams. Typically, he priced them too low and made no money. But he was in the cartoon business. His folks had returned to Kansas City, but they didn’t stay for long. In 1921, Herbert, Ruth, Flora, and Elias moved to Portland. Then Roy came down with tuberculosis and went to a hospital in Arizona. Walt, all alone, found a place in a rooming house.